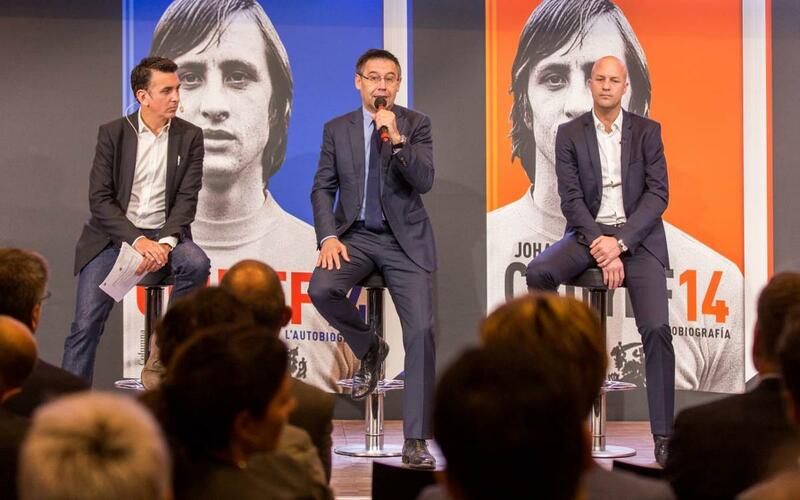 The 1899 Auditorium hosted the official presentation of the book "Johan Cruyff 14. The Autobiography" this Monday at noon. The event was attended by the Barça legend's son Jordi Cruyff; his widow, Danny Coster; and a group from FC Barcelona headed by president Josep Maria Bartomeu. The delegation included the vicepresident, Jordi Cardoner; the vicepresident of sport, Jordi Mestre; the directors Xavier Vilajoana and Oriol Tomás; and the CEO, Òscar Grau. Others in attendance were: Ramon Alfonseda, president of the Barça Players Group; ex-fitness coach, Paco Seirul·lo; ex-Barça footballers Toño de la Cruz and Joan Vilà; other members of the family like Jesús Angoy; friends of the Dutch legend; representatives from the Johan Cruyff Foundation and Institute; the president of the Obra Social 'la Caixa', Jaume Giró; and the president of the Catalan Football Federation, Andreu Subies. Bartomeu started proceedings by expressing “how happy we are to host the book launch at FC Barcelona's installations.” The president also recognised the importance Johan Cruyff had on the past, present and future of this club with particular emphasis on the role he played in the FCB Foundation and FCB Universitas. The book was written in first person with the collaboration of Dutch journalist Jaap de Groot, edited by Planeta and Columna Editorial, it was presented last week in London and has become the biggest non-fiction seller in the last week.